So, You Need a Root Canal? When your dentist tells you that a root canal is necessary to save a tooth, he is concerned that bacteria has entered into the soft central portion of the tooth--the pulp. Given enough time, such a tooth will abscess--a condition where an infection sets up about the root tips of the teeth when bacteria enters into the normally sterile bone. Root canal therapy cleans, shapes and fills the hollow root canals to prevent bacteria from getting into the bone. Teeth with infected pulps or infections about the root tips can be very painful. Root canal therapay will usually provide significant, instantaneous relief of such pain. This procedure involves accessing the central, hollow chamber of the tooth, and then removing the dead, decaying or diseased pulp of the tooth. Once removed, the hollow center of the tooth is disinfected, shaped and filled with a material that plugs up the root tip openings--further preventing infection down in the bone. This filling material--gutta percha--is a pink colored, rubber-like material that not only seal the canal well, it can be melted and ground out if necessary to re-treat the rooth canals. Older root canals used to be filled with silver points. These silver points were not ideal in that sometimes the seal at the root tip failed. In addition, if the tooth needed work completed on its crown portion, any disturbance or bumping of the rigid silver points could disturb the seal at the root tip opening--causing the root canal to fail. Thus, another beneficial quality of gutta percha is that the material can be touched, ground, melted out or cut off without the seal being broken because the material is not rigid. The center photo to the left, shows how endodontic files are used to clean and shape the root canals. Root canal therapy is often performed with the aid of a rubber dam. 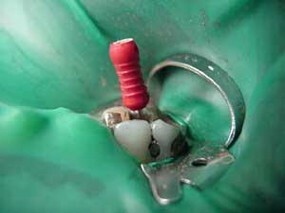 The rubber dam isolates the individual tooth being worked on. This prevents small instruments from being swallowed or inhaled into the lungs, but it also keep saliva and bacteria out of the canals. In addition, the dam also protects the patient from some of the potent disinfecting chemical used to clean the root canal system. 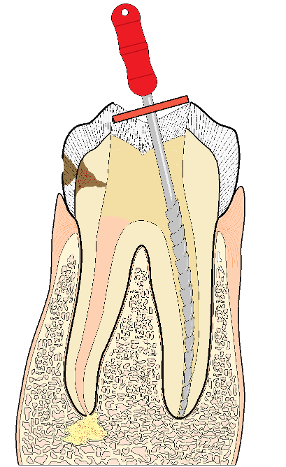 In most cases, a root canaled tooth needs to have a crown placed on it when the root canal is finished. The loss of a blood supply makes the endodontically treated tooth more brittle and susceptible to breakage. The tooth dehydrates and becomes less flexible without its blood supply. While these teeth can still take much pressure on them, they do not do well with shearing forces--which are typical when we chew. The big opening at the top of the tooth further weakens it. A crown put over the tooth is inflexible and so pressure exerted on the tooth will be distributed over the whole of the tooth when a crown is in place. Crowns and root canals often go hand in hand.